So, yesterday I presented a session for the online SharePoint Saturday event SharePoint Saturday EMEA on using SharePoint & jQuery. I created this session as an overview session on using jQuery and SharePoint together detailing best practices on deployment, maintenance, performance, and hopefully pointing some people to some good resources to help them get started. 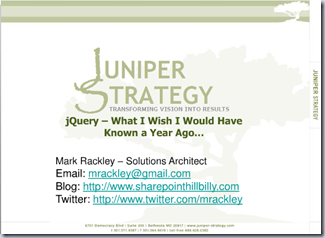 I also spent some time on why jQuery is a valuable tool for the SharePoint developer’s toolkit. If you aren’t just a jQuery hater, then you can’t deny it’s potential to make you and your customers happier. I also gave a big shout out to O’Reilly who have two GREAT pocket reference books for the novice or pro jQuery developers. I’m not a big tech book “reader”. 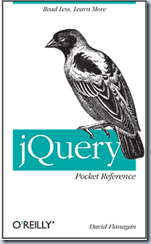 I don’t care WHY it’s called jQuery or the history of the first person to use it. I want to know how to do “x” and I want to find how to do it quickly. 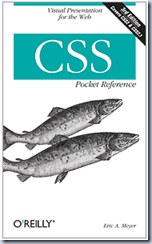 These two books fit my needs perfectly, and for $10.99 for the jQuery Pocket reference and $7.99 for the CSS pocket reference (PDF versions) it’s relatively cheap compared to other books as well. I put both books on my dropbox account and now can read them from my tablet, phone, and PC whenever I need to find something quickly. We REALLY need more good reference books out there, so you aspiring authors get to it! Anyway… I had a GREAT virtual room of attendees asking a lot of great questions. It’s hard to gauge feedback doing these sessions online, but from the lack of hate mail I received afterwards I assume it was mostly good. I did run out of time there at the end and didn’t get to show as much as I wanted to of the demos, something I’ll definitely have to keep in mind for the future. I will be improving upon this session and presenting the updated session w/ demos at upcoming SharePoint conferences around the country this year, so keep your eyes open for it. Thanks again to all those who attended!